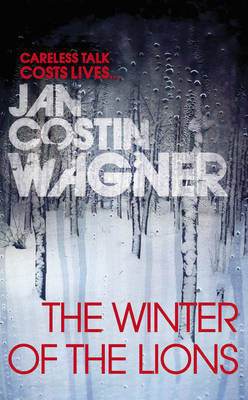 THE WINTER OF THE LIONS is an ethereal book: a police-procedural novel with an other-wordly quality about it. Kimmo Joentaa, a Finnish police detective, is still reeling from the death of his wife just before the start of ICE MOON, the first in this series of which this novel is the third. Joentaa numbly goes about his duties, taking a statement from a young woman who claims to have been attacked by a client - the implication being she is a prostitute, though she leaves the station before Joentaa can find out very much. On returning home that night, Christmas Eve, the woman turns up at Joentaa's house and together they install and decorate a tree - which can be seen as the start of the slow thaw of Joentaa's deep-frozen state. The plot, such as it is, concerns two murders that occur on the same night - one is of the forensic specialist who does the autopsies for the police team; the other is of a puppet-maker. Joentaa soon discovers that both men took part in a TV talk show in Helsinki, so the investigation shifts to the capital. However, not a lot happens - the police never seem to do very much despite an attack on the smarmy host. Joentaa falls into an introspective mode in which he senses that the TV show must be central to the crime, but cannot say why (to himself or his colleagues). He repeatedly watches the DVD of the show, finding new clues each time, but no details are shared with the reader. Eventually, Joentaa's intuition centres on the strange woman whose thoughts we (the reader) have been sharing. We know this woman has suffered a terrible but mysterious loss, but it takes Joentaa's idiosyncratic, intuitive mind (rather than prosaic details such as the police checking through lists of possible suspects) to put all the pieces together.